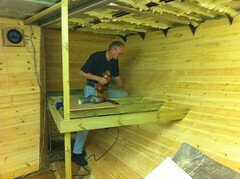 Here you see Andy in an action shot - in the process of securing one of the supporting pieces on the second bunk. The picture is a little deceptive, in that the bunk is a double width bunk, and more than long enough to accommodate six foot plus occupants. Sitting on the completed platform, leaning against the side wall, I finally get a much better impression of just how much space there is down here. Like the first bunk, there is some way to go with the fitting out of storage space below the bunk and the cladding and curtaining around the bunk itself. For the first time ever, I've had a really clear view of just how this space could look when finished. Plenty more to do though... Too much to even contemplate making any kind of list. As part of an order for some more electronics components, I saw some LED's in the 'customers who bought these also bought these' section. I thought 'why not' and ordered 10 of them. Big mistake - you can see a strip of seven of them in the picture - the little green dots you can see are the LED's themselves. They have no wires or anything, as they are designed to be soldered flat onto a circuit board. I put a normal sized pencil in the picture by way of a comparison. I don't see how these can be much use to me, as they are just so tiny. Not unless I have a sudden inspiration. The most amazing thing about the lights is that each of those tiny spots are in fact both a green LED and a red LED in the same package. 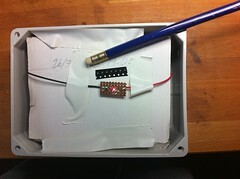 Before finally getting one of these soldered down and working, I'd already lost one and burnt out another! Anyway, it struck me it might be interesting to connect one of these up to a set of those big D sized batteries (4.5V and 510 ohms for the detail guys) and see how long the light stays on with the same set of batteries. Now summer is in full swing, the river has got very busy. 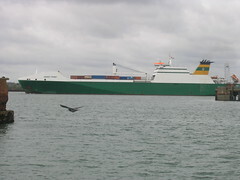 In amongst it all are the big commercial ships. Here you see 3 of these ships offloading alongside. The ship closest to me was busy offloading a huge big pile of rocks. I'd cringe at the thought of rocks being dropped into the bottom of my hull. I guess that hold is especially strengthened, or has some kind of liner in it to protect it. Who would want a shipload of rocks I wonder? A little bit of Greywell. A village near my house. The one thing using the RIB brings is a certain type of freedom. The Old Sow was never much good in 'lumpy' water, so I rarely went out beyond the end of the River Itchen. A bit more power and a bigger boat fixes all that, especially a tough old rib like the SeaRider. 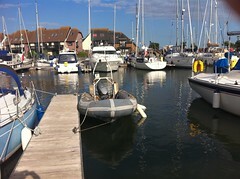 Here you see the RIB nestled in with some up-market company during a recent visit to a restaurant, over in Hythe, with Patch. As it turned out we had the perfect weather for it, and an easy run up the river home to Lady Jane afterwards. 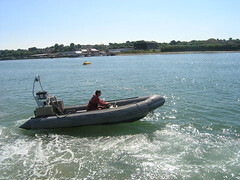 I thought I'd show a picture if the RIB (HBI) in action, and yes, that's me driving it. The picture was taken by Fred, just as John was lining Lady Jane up for her mooring. I, meanwhile, was about go pick up her forward mooring line, previously left on the buoy, to hand back to Fred on board. I'll be the first to admit that it's not the prettiest rib in the river, but that extra horsepower, compared to the old sow, sure helps nudge Lady Jane around. It's also much more fun out on the water than the old sow. Now the choice is whether to keep using the rib (better), or to start using the old sow again (cheaper). While on the subject of Ships and things, something I had not given much thought to until my stay in Southampton docks was how there is an entire industry related to ships arriving, staying in and leaving port. Asides for the obvious of berths, tugs and cranes and things of course. 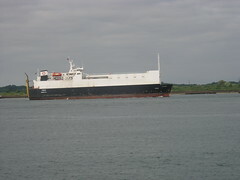 When big ships arrive and leave, they need a qualified harbour pilot on board. He ensures the ship gets exactly where it's supposed to without any issues. Of course the pilots need taking out to the ships outside the port, and fetching back in again in all kinds of weather and seas. Also, the big boats get escorted within the port - a role skipper John is well acquainted with! Once a big cruise ship has arrived there is all kinds of activity, both land and sea based to take care of it. Food and drink for the passengers, crew changes, parking attendants and removal of the waste. The thing that particularly attracted my attention to all this 'big boat business' was the Whitchallenger, which is a massive fuel tanker which brings the fuel to the various big ships about the port. It's all perfectly obvious now. 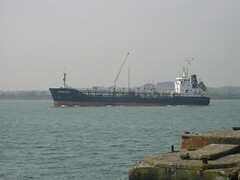 The picture shows Hurst Point, a vessel I quite like the look of. Maybe it's just me, but it has a definite appeal. Possibly because it's got that built to last look about it. It would need to be tough, as it's a commercial vessel run for the military so would need to be able to go pretty much anywhere, any time. I bet that being in the kinds of conditions it looks like the boat is built for would be "interesting". 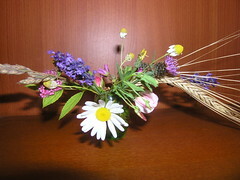 There is always something to do, almost no matter what. In the past, I had saved up engine room work for the winter. The problem is, in the winter it's just too cold to work down below with all that cold steel about (my excuse). 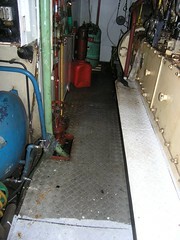 Here you see the continuation of a job Fred started some time ago, the cleaning and painting of the engine room deck. A pretty thankless task at the best of times, though not to bad to be doing when it's not cold and too wet and/or windy up above to do anything there. I can't complain about the weather so far this summer though. 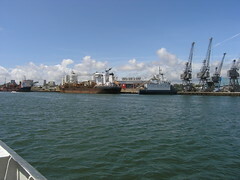 In my brief stay in Southampton docks, I saw quite a few ships of various shapes and sizes. All interesting to me in one way or another. Ivan is, in my opinion, about the ugliest one I saw. I'm sure she is very functional, and that her owners and crew love her.